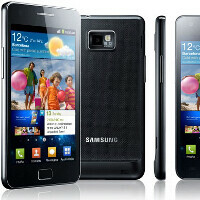 The Samsung Galaxy S II was announced with much fanfare back at MWC, but we've only gotten to hold an early unit of Sammy's upcoming flagship. The final unit, though, appeared in the wilds of Russia, and by wilds we mean a night club. That – as you might imagine – is the perfect environment for some rigid testing of the full HD video capture of the Galaxy S II. The sight was captured by a Russian tech blogger, reportedly after the HTC Meetup event held in Moscow. Or wait, was it at the HTC Meetup? That's what the YouTube heading claims and boy what an event that was! Oh, and we leave the irony of having the Samsung Galaxy S II at an HTC event aside and let you evaluate those beautiful pixels. Be warned, though, that you might experience a sudden urge to visit a Russian night club as the content could be rated fairly restricted. Don't forget to let us know what you think of the 1080p video recording capabilities of the handset in the comments, okay? We have nothing to go on to prove that this video was from the SGSII. I think we've been trolled, it is April 1st after all.